Here is a pic just 3.5 miles later at mile 16.5 and I was hot! But don’t worry, there is no stop in my head, maybe slow down but never to quit. 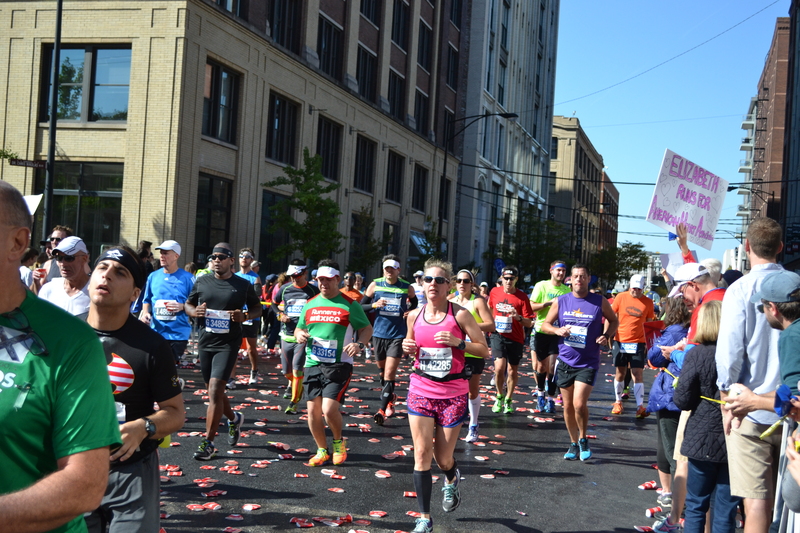 I was thankful for carrying my fuel belt with water because I was able to utilize the water stations to refill and then drink freely as I continued on and try and fight off any leg cramps that do happen to me at most marathons (big accomplishment #2). Since I had no idea how I was doing on time, I just kept pushing on and when the clocks read 5 hours and 28 minutes at one point I was thinking, “this might be my slowest marathon ever but let’s just enjoy the race”. I think that really helped me relax and realize it is just finishing the race that makes me a marathoner not the time (accomplishment #3). At mile 25.5 we found ourselves running through a huge crowd that was very quiet and for fun I threw my arms up in the air and got the crowd cheering. It was so much fun to hear them cheering for us marathoners because at this point, we were all going to finish the race. Even better was the fact that when the race signs said one mile left, I had started to run and did not stop running until I crossed that finish line (accomplishment #4). This was the first time I have been able to run the whole last mile. When I finished I was in tears. Happy Tears, exhausted tears, some upset tears because I thought it was my slowest ever, but then back to happy tears because I did it! #5 was in the books. I was able to talk to my daughter shortly after I crossed the line. She was getting texts while she was at school and called me to tell me Congrats right after I finished. So sweet! I finally found Dave after what seemed like forever and a very long walk to the runner family reunite area. We were able to hang out in the beautiful park, enjoy the wonderful weather and reflect on the huge accomplishment that I had just completed, oh and see that really my finish time was 4:49:39 with an average pace of 11:03. Yeah, not my slowest and really when I look back to April (5:13:58 with 11:59 pace) what a huge improvement (accomplishment #4). 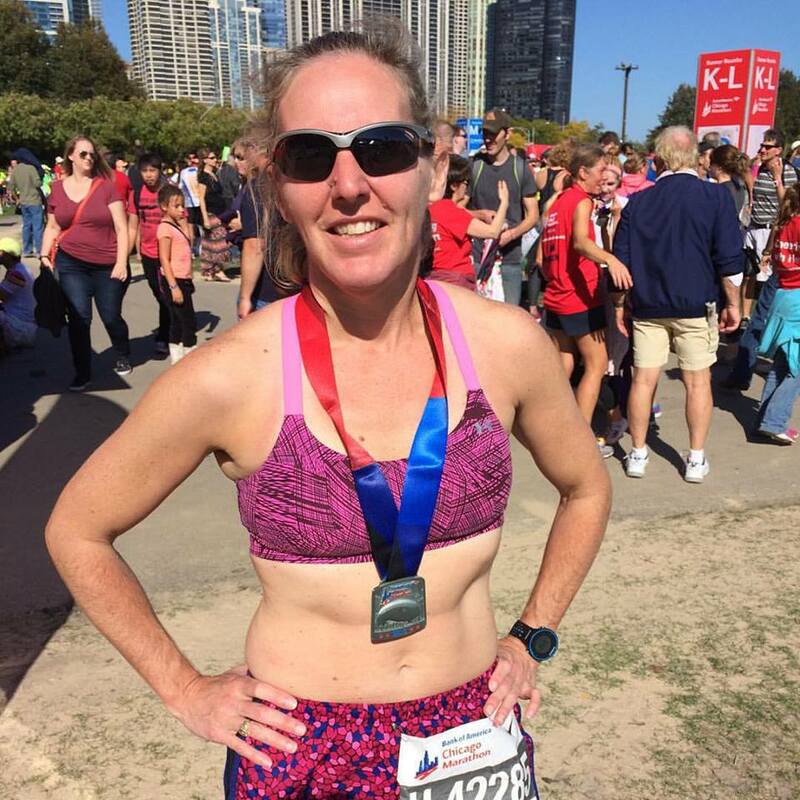 We all have lofty goals when we begin training for huge races like marathons and sometimes these lofty goals tend to block the whole idea of doing something because we love it and it really is something that not a lot of people attempt. I am no different. I wanted to have my fastest time ever but that was not to be. I wanted to run sub 10 min miles but again that was not to be. I wanted to have fun and that did happen. I wanted to be more comfortable and not start the self-doubt early in the race making the race miserable and I was more comfortable and really never had a doubt that I could and would finish. 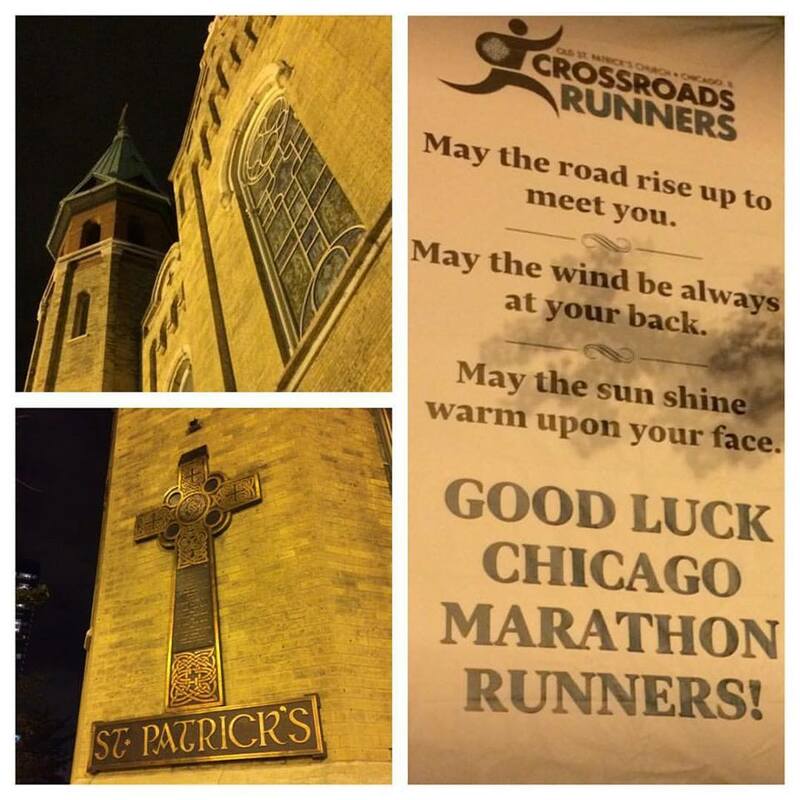 This church was at mile 13 and loved the sign on the side of it. 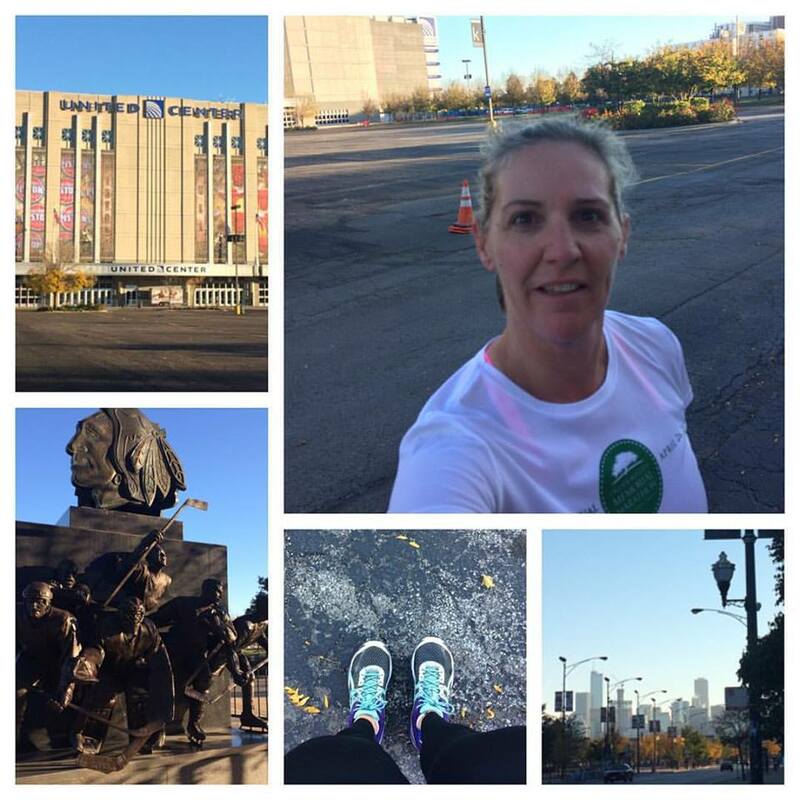 Three days later my first run post marathon and last run in Chicago before heading home. I hope the recap was worth the wait. Thanks for reading.